PRESIDENT BUSH WALKS FROM THE OVAL OFFICE TO THE SOUTH LAWN WHERE HE JOINS LAURA BUSH. THEY STAND ALONE WITH THEIR ARMS AROUND EACH OTHER AND WAVE TO STAFF MEMBERS ON THE SOUTH LAWN. THEY WALK TO MARINE ONE AND DEPART FOR CAMP DAVID. 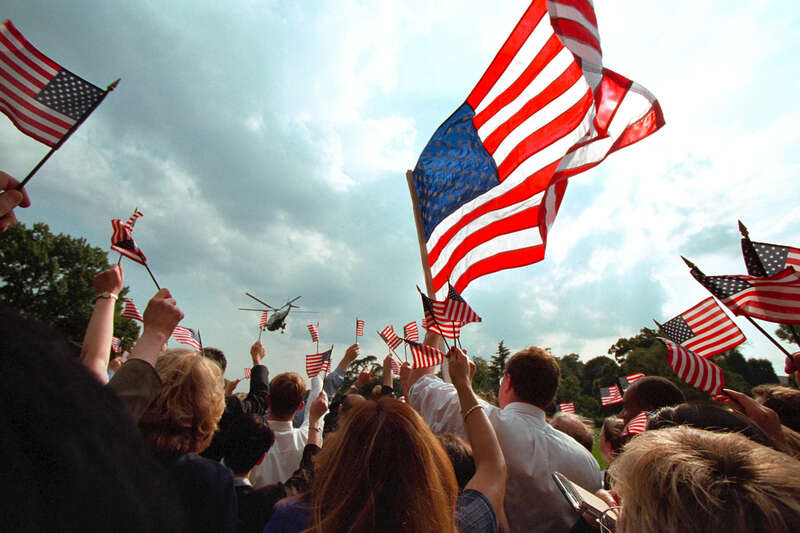 STAFF MEMBERS WAVE AMERICAN FLAGS AS MARINE ONE TAKES OFF (RELEASE, JUMBO P7680-23 IS A WHITE HOUSE WEB SITE PHOTO). THE SOUTH PORTICO EXTERIOR OF THE WHITE HOUSE IS IN THE BACKGROUND AS MARINE ONE TAKES OFF. PHOTOGRAPHERS ERIC DRAPER AND PAUL MORSE WALK TOGETHER FOLLOWING THE DEPARTURE. INCLUDES PHOTOS OF BRAD BLAKEMAN, KARL ROVE, KAREN HUGHES AND OTHERS AT THE DEPARTURE. JOE HAGIN TALKS WITH ARI FLEISCHER, HECTOR IRASTORZA AND GORDON JOHNDROE ON THE COLONNADE.